Last night my boyfriend took me out to dinner to get my mind off of my cat (and because we hadn’t had a night out in a bit). Our waitress started off by immediately coming over with a bottle of wine and offering us a sample. Out of habit, I almost said yes; but I caught myself and slowly said “no thank you” and ordered a water. Brandon accepted a sample, and then the waitress looked at me and said “is it because it’s a dry wine? Because I can let you sample another kind.” At that point I was like really dude? I already said no thanks. So I said politely, “no I actually don’t drink” and she looked at me like that wasn’t really a thing. At that point I really wanted to say “I’m a recovering alcoholic who’s newly sober CAN YOU PLEASE BRING ME MY STUPID WATER.” But I just kind of stared at her instead. When she walked away, Brandon said “I kind of thought she was going to try pouring the wine into your mouth because she was so insistent that you try some.” At least I wasn’t the only one who felt like she was being pushy. In the end we both laughed about it, and I later shared the story with one of my close friends who is also in the program. Her response was so perfect that I had to share it. My point here, I guess, is not even that people need to be more sensitive or whatever, because no one needs to go around worrying they’re going to offend everyone. My point is more that if someone says no to something, that should be enough of an answer. No need to ask 60 times until I throw my AA chip at you. 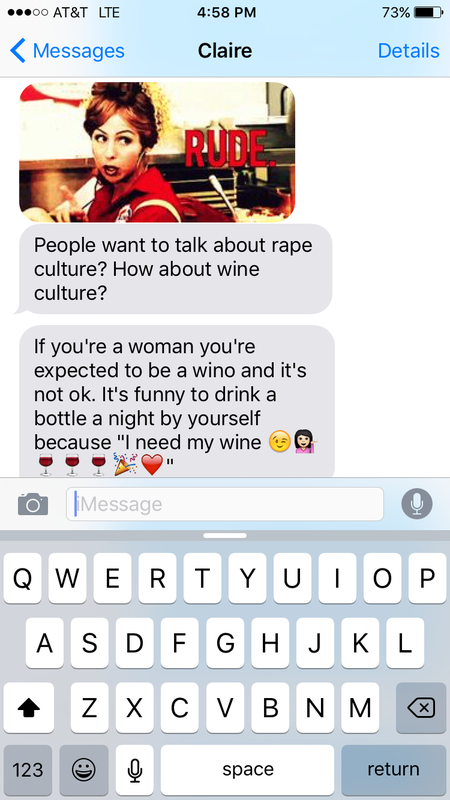 As a person who works in retail, I know she’s trying to up sell us to ordering wine, but again, if someone says no, that should be a good enough answer.